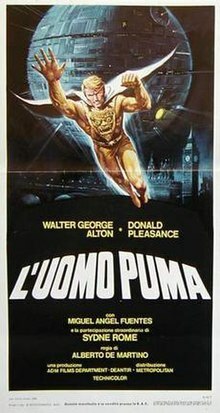 The Pumaman (Italian: L'uomo puma) is a 1980 Italian superhero film co-written and directed by Alberto De Martino, starring Walter George Alton as the Pumaman and Donald Pleasence as the villain. It was featured in a 1998 episode of Mystery Science Theater 3000. Thousands of years ago, aliens visited the Earth and became gods to the Aztecs. The aliens fathered the Pumaman, a man-god with supernatural powers who would guard the people of Earth. The original Pumaman was entrusted a gold mask with the ability to control people's minds. In the present-day London, archaeologist and daughter of the Dutch ambassador, Jane Dobson (Sydne Rome), has found the mask and deciphered its instructions: when aimed at someone, it can be used to control their mind. Her employer, the villainous Dr. Kobras (Donald Pleasence), plans to use it to control the minds of world leaders. He makes Jane his first victim. Kobras somehow learns the Pumaman will be after the mask and begins a campaign to discover Pumaman’s identity. American paleontologist Tony Farms (Walter George Alton) survives defenestration by a mysterious Native American named Vadinho (Miguel Angel Fuentes). Soon afterwards, Jane invites Tony to a party at the Dutch embassy, so Kobras' mind slaves can kill him. Later, Vadinho confronts Tony and explains about the Pumaman’s abilities and origins. He claims that Tony's full powers will develop when he wears a magical golden belt, but Tony is skeptical. At the embassy party, Kobras’ henchmen try to subdue Tony, but he manages to fight them off and escapes by flying from the roof after donning Pumaman’s magic belt. Vadinho explains Kobras' sinister scheme and persuades Tony to follow Kobras to his lair. Kobras’ henchmen swarm out to shoot down Tony, but he evades them. Meanwhile, Vadinho has used his mystical amulet to learn that Kobras is in a mansion of some kind. Tony uses an electronic position indicator, borrowed from a policeman friend, to Kobras’ lair (Stonor Park). Kobras has convened the heads of state of the entire world and begun controlling them with the mask. Kobras orders Jane to shoot Tony but her love for him helps her to resist him. Kobras fends off Tony’s attack with a force field which strips Tony of his powers. Kobras twice attempts mind control on Tony, but Vadinho helps Tony focus his mind on resisting the spell before escaping. Vadinho teaches Tony another superpower which slows down his metabolism enough to fool Kobras into believing Tony is dead. Vadinho damages the mind control apparatus by throwing a stick of dynamite. Freed from Kobras' control, Jane smashes the replica of Tony's head, which restores his Pumaman powers. He joins the fight with Vadinho and defeats all of the henchmen. Kobras escapes to a helicopter. Tony catches up to him, and with some deft aerial manoeuvring, manages to crash the chopper with Kobras inside. With the world safe, Vadinho, Tony and Jane head to Stonehenge with the mask. Vadinho summons the aliens with his amulet, and before joining them to return the mask to the Andes, he tells Tony to look for him when it is time to train his future son to be the next Pumaman. The film ends as Tony flies into the air with Jane and embraces her. In the late 1970s, after science fiction films such as Close Encounters of the Third Kind, Star Wars and Superman became popular, Italian film makers began injecting science fiction themes into their films. Director Alberto De Martino stated that the film "was a production based on the trend of the moment. I had always done it that way and always done well. But regarding this genre of film, there was the audience's diffidence toward Italian movies featuring special effects. They knew we were not up to the task, and didn't take us seriously." De Martino was also not happy with the film's script and attempted to inject humour into it as an attempt to save the film. Pumaman was Walter George Alton's only film role before becoming a medical malpractice attorney in New York City. Alton was later interviewed in a satirical fake news sketch on The Daily Show with Jon Stewart in November 2007. De Martino noted problems with the special effects in the film, stating that Italo Zingarelli had purchased a camera in Germany to create the flying effects in the film, but the technicians were not able to use it properly. To not go beyond schedule, these shots were shot with a blue-screen in just two days. The Pumaman was released in Italy in 1980. As of 2016, there has been no official release of The Pumaman on DVD, but was made available through the Mystery Science Theater 3000 television show. Shout! Factory released the original film as a special feature with the Mystery Science Theater 3000 edit on Volume XXIX. The film was featured on the show on April 4, 1998. The director Alberto De Martino declared the film as "the only pic I did wrong in my whole career" and that "When I saw it was a flop, I started asking myself questions. I had made a film I shouldn't have. However it did well abroad and managed to get the guaranteed minimum back, otherwise I'd have had to sell my house. It did not even gross half a billion lire in Italy." In his book on Italian cinema, Howard Hughes described the film as "one of the worst superhero movies of all" noting an "awful script" and that the film was "amateurish in all departments, but the flying sequences stand out, as becaped Puma Man is suspended, flailing, by the seat of his pants from wires." ^ a b c d e f g h i Curti 2016, p. 160. ^ Muir 2004, p. 438. ^ a b c d Curti 2016, p. 161. ^ a b Curti 2016, p. 162. ^ a b Curti 2016, p. 163. ^ "Mystery Science Theater 3000". TV Guide. Retrieved October 11, 2016. ^ Hughes 2011, p. 175. ^ Hughes 2011, p. 176. Hughes, Howard (2011). Cinema Italiano: The Complete Guide from Classics to Cult. I.B. Tauris. ISBN 0857730444. Muir, John Kenneth (2004). The Encyclopedia of Superheroes on Film and Television (2 ed.). McFarland. ISBN 0786437553. This page was last edited on 28 March 2019, at 04:01 (UTC).